This product contains 5 Vacuum Cleaner Dust Bags. This allows you to vacuum clean for a long time. Intense Filtration ensures a high quality vacuum cleaner experience. These vacuum cleaner dust bags are made of microfiber. This material has a very delicate structure which keeps dust inside the bag. Furthermore, microfiber is a very strong material which makes the bag very hard to tear. The collar (A) of your vacuum cleaner bag has a specific size (height and width) and shape to ensure proper connection with your vacuum cleaner. The connection is usually made of cardboard but plastic connections are increasingly common. The connection of the bag is important so that dust does not escape. The size and shape of your original dust bag can differ slightly from the DustDeal vacuum bag. That's not a problem. As long as the collar fits firmly into your vacuum cleaner. 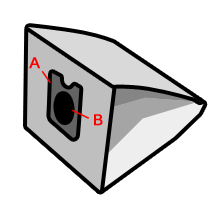 Besides the dimensions of the connector the diameter of the connection ring (B) is also important for a proper connection with your vacuum hose. A correct sealing of the vacuum cleaner hose avoids dust leaking outside the dust bag. The connection ring is most of the time provided with a rubber seal which ensures that the tube is enclosed and dust is kept into the bag. This Dust bags Microfiber (5 bags) is made from premium microfiber. This ensures you will get the best vacuum experience possible! Is your Metabo ASR 35 M vacuum clear losing suction due to a stuffed dust bag? Replace the dust bag! These Dust bags Microfiber (5 bags) makes sure your vacuum cleaner will last for a while again.